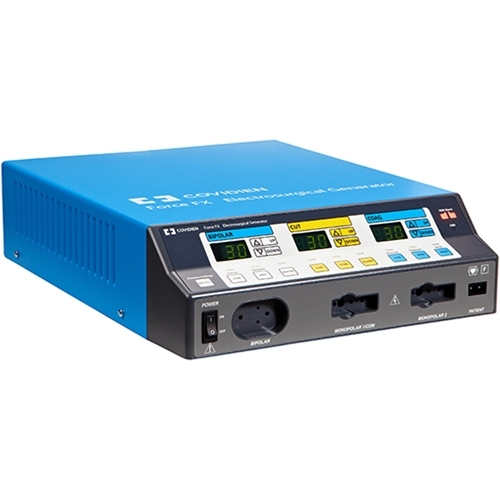 The Medtronic Covidien Valleylab Force FX is a high-power digital electrosurgical unit. The Force FX features computer-controlled instant response technology that ensures a consistent clinical effect through all tissue types. This instant response technology recognizes changes in tissue 200 times per second and adjusts voltage and currently accordingly to maintain the proper power. 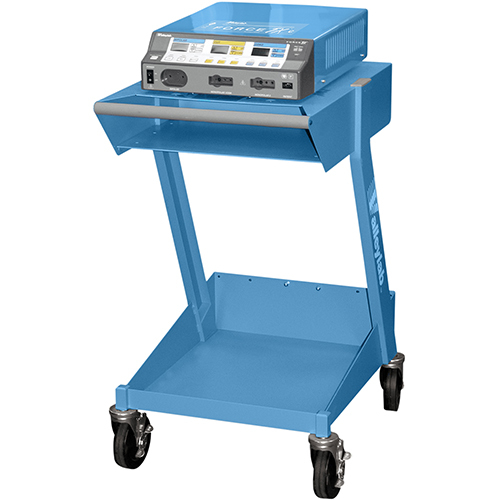 The Valleylab Force FX enables the use of handset or footswitch controls to activate the generator. It provides surgeons with the advantage of accurately delivering the selected power setting, even through resistant tissues. Instant Response technology that ensures the power delivered remains virtually constant, regardless of the tissue type. Three internal microcontrollers that reduce system reaction time and increase the system’s processing speed. Spray coagulation voltage of no more than 9000 volts for broad, but superficial coagulation with limited capacitive coupling. Compatible with the exclusive Computer Motion Hermes Voice Command System. Input Power Requirements: Operating range is 85 to 132 AC volts. Maximum current is 7 amperes in Cut and 4 amperes in Coag. Blend: 390 kHz bursts of sinusoid, recurring at 27 kHz intervals. 50% duty cycle envelope. Desiccate: 240 kHz sinusoid repeated at 39 kHz. 8% duty cycle. Warm -up time: If transported or stored at temperatures outside the operating temperature range, allow one hour for the generator to reach room temperature before use. Acceptance range is 5-135 ohms after REM PolyHesive II return electrode is applied. Adaptive REM: REM trip is baseline impedance plus 40%. For example, if the baseline impedance is 30 ohms, the upper level trip is approximately 42 ohms. If the pad-patient impedance falls below the baseline impedance, a new baseline is established. Questions about our Electrosurgical Units? The Force FX™ generator adjusts automatically, responding to tissue changes, maintaining power delivery, and minimizing drag. Capacitive coupling is reduced by 30-50% when using Instant Response technology. This reduction is achieved by limiting the RMS voltage and the high-frequency harmonics. Lower voltage means less neuromuscular stimulation and more precise delivery of energy to reduce collateral damage. 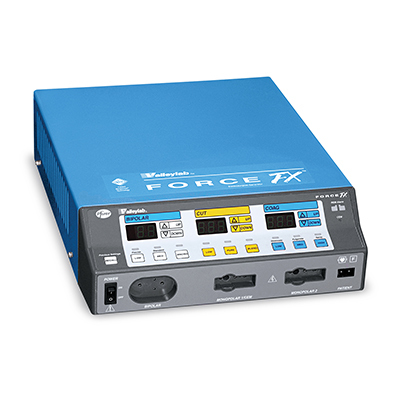 Soma Technology, Inc. offers the Valleylab Force FX Electrosurgical Units up to 50% below OEM prices with the same service and warranty as new. Soma Technology technically and cosmetically refurbishes these electrosurgical unit’s back to the original engineering manufacturer specifications. Using highly skilled, trained, and certified in-house biomedical engineers these units are fully tested, disassembled, and if necessary, parts are replaced. Once all the parts of the Covidien Force FX are in working order, the electrosurgical unit is calibrated back to OEM specifications, to make sure it works exactly the way it did when it originally left the manufacturer. Soma Technology not only refurbished the product, but each unit also goes through a Special cosmetic restoration process. The Force FX is cleaned and minor scratches and denture are repaired, and decals are replaced if necessary. 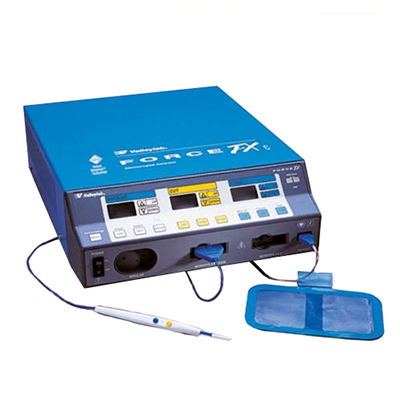 Soma Technology, Inc. also purchases used and pre-owned electrosurgical unit’s. If you or your facility wants to sell your Valleylab Force FX, Soma Technology has an experienced purchasing department that makes the process headache and hassle-free. When selling your electrosurgical units to Soma, there is no need for a middle man, it is a direct transaction to Soma which ensures that you get top dollar for your medical equipment. Soma Technology not only buys electrosurgical units but a wide variety of different medical equipment as well, if your medical facility is looking to free up space. If you have medical equipment you would like to sell to soma, send us a message here!